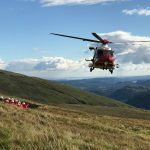 A mountain biker suffered a broken ankle after coming off at the tricky rocky section on the bridleway that contours Lonscale fell. The Keswick MRT Land Rover was dispatched and managed to get within 100m of the casualty. After some first aid the casualty was placed on a stretcher, and in deteriorating weather, was carried to the Latrigg carpark and a waiting ambulance.